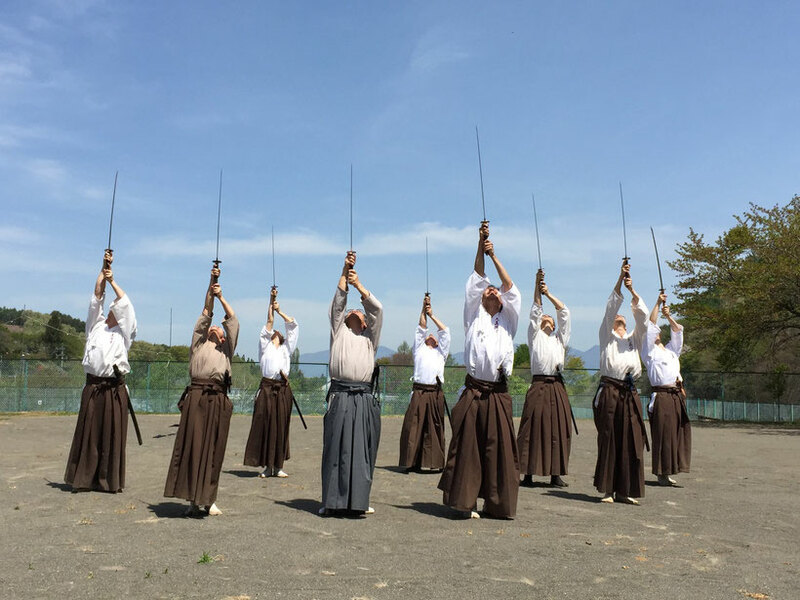 Below is an article written by Founder Hiroyuki Aoki in 2013, providing an in-depth explanation of Tenshin Philosophy, which is at the very core of Kenbu Tenshin Ryu practice (and also of Founder's earlier creation, Shintaido). An essential writing for all Kenbu Tenshin Ryu practitioners and those willing to understand the underlying philosophy of Kenbu Tenshin Ryu practice at a deeper level. In Kenbu Tenshin Ryu, our goal is not only to practice wholeheartedly to acquire correct and effective sword techniques, but also to "polish our hearts and minds", "elevate our spirits", and "deepen our spirituality" at the same time. The following in-depth explanation of Tenshin Philosophy is intended to provide you a full understanding of the profound goal of Kenbu Tenshin Ryu. In Tenshinkai, we attempt to learn the philosophy of Do道(Way) accurately from classical Chinese and Indian texts. In Japan, calligraphy is called "Shodo書道", but in China, it is referred to as either "Bokudo墨道" or "Shoho書法". However, they all mean the same thing, and it is people who lack knowledge on the history of calligraphy that make such comments as; “Japanese calligraphy is a kind of Do道 because the word Shodo書道 has the character 道 (Way) in it, whereas Chinese calligraphy is solely based in techniques since it has the character 法 (method) in it." In fact, "budo武道" used to be called "bujutsu武術" in Japan for a long time until it began to be called "budo武道" in the Meiji period. Then the questions is this; can we assert that bujutsu武術 practiced before and during the Edo period is merely jutsu術 (technique, art) without any spiritual aspect, as it does not include the character "道(Way)" in the word? Of course, that is a big mistake. Each of the respective schools of bujutsu had a profound philosophy passed down through the ages. On the other hand, although modern martial arts such as Judo柔道 and Kendo剣道 both use the character "道", they have merely become a sport with its major purpose being competition in the Olympics and various championships, where they fight like beasts. Furthermore, it seems as if the word "道" is being appropriated by a form of business called “Do道Education Fundraising System” that takes advantage of this profound philosophy of "道" to fulfill their own business goals under the term “Education”. Of course, we can dismiss this issue by saying “oh well, that’s just another form of business” if we wanted to. However, it is because of this current reality that it becomes extremely important for each one of us to understand the philosophy of Do道correctly, in its most authentic way. Furthermore, because it becomes essential here to think deeply about life, heart and mind, and way of life, we cannot avoid thinking about religion in this process. As a matter of fact, the philosophy of Do道 has a strange universality that can easily be accepted by all of us, regardless of our religious backgrounds. Before I start, I would like to clarify my own religious and philosophical background and how they have led me to develop the Tenshin Philosophy. I was raised by a father who believed in Jodo Shinshu, and a mother who believed in Nichirenshu. I was a devoted Protestant until about just after I entered my thirties. However, I had a big satori at the age of 32 that awakened me to a profound realization of what is commonly referred to as "Absolute Nothingness絶対無" or "Great Void大いなる空", that vanished all my religious ideas and beliefs I had previously carried. Hence, I could call myself non-religious now, or in other words, a follower of “Universe and Body Religion” (of course, this is just my own imaginary religion). We could define religion as an expression of faith in God or some kind of supernatural being or power, or a belief in the sacred that have been divided from the profane. It is meant to be "the most fundamental teaching for humanity". What is interesting is that Amaterasu Omikami (the Goddess of the Sun), the most divine God in Japanese Shintoism, and Dainichi Nyorai (the Buddha of All-Illuminating Wisdom) in Buddhism both symbolize Light. Similarly, the different kinds of Gods in Judaism, Christianity, and Islam are also Light (although in the original scriptures, it is said that it was God who created Light itself). If the highest God worshiped in various religions are referred to as Light, it presupposes having "Absolute Being (existence) 絶対有" at the very root. And that "Being (existence) 有" can manifest only from "Nonbeing (nothingness) 無" in the background. However, "Being (existence) 有" as opposed to "Nonbeing (nothingness) 無" is still not absolute. In order for "Nonbeing (nothingness) 無" to be absolute, we must assume "Absolute Nothingness 絶対無" further in the very background. This has been expressed by ancient people as "Absolute Emptiness太虚"or "Tenshin天真". We should remember that these terms are not solely Zen terms, and the same philosophy had existed far earlier in Roshi and Soshi's Philosophy, Christianity, and esoteric teachings of Judaism (the mother of Islam). In reality, I think there is not such a thing as a God or a Buddha possessing a human figure in the universe. What exists is just the fundamental life force of the great universe and some kind of great Will. The only truth is that the life force manifests itself in various ways in accord with a certain Will (Law) that collects gas, explodes them, forms matter, turns them into stars, and creates this great intergalactic space... It is said that the intergalactic space is about 100,000 light-years across from one end to the other. Imagine the same life force creating something so big like this humungous space, to something so tiny like viruses…We human beings, as well as the nature that surrounds us, are all made from this fundamental life force of the grand universe. Would it not be enough to call this force, energy, or Law, “God”? This is why we should all come to realize that each one of us are a part of this grand universe by harmonizing with the great force, nature, all creations of this great force, and feel the oneness with the universe. Such realization would lead us to live our lives that is itself a small universe more fully, and fulfill the purpose of our existence in this world. Kenbu Tenshin Ryu and its mother body Shintaido are both body practices that enable us to realize this goal through body movement. Even if you called yourself an atheist or a nihilist or belonging to some other religion, you cannot deny the existence of "a life force of the grand universe". If you did, this earth and even ourselves, would not have existed at all. Shinran (founder of Jodo Shinshu) mentioned, “Among all the Buddhas, Amida Nyorai is the greatest.” He added, "that is because it is Jinen自然". Jinen自然means naturalness, or spontaneous working of the Vow (of the universe or Law of nature). Dogen (founder of Sodoshu) who trained under Taibai Hojo (Japanese Zen Master), taught that the most important teaching in Buddhism is "Zuiryuko随流去 (to live in accordance with the flow of nature and the universe)." However, when we take a closer look at the teachings of great religious masters or high priests, sometimes what they say to beginning practitioners is contradictory to what they teach advanced practitioners. They may teach beginning practitioners "to love others" and "to pray", but tell advanced practitioners, "God will not be able to pour in love if you already have your heart filled up with prayer and love." There is also a Zen monk that even mentioned the following provocative phrase; "If you meet your Master, kill your Master, if you meet your parent, kill your parent…" What this means is, "if you have stones in the pail such as love and prayer, you have less space to pour in water." In other words, you should get rid of everything except God. This philosophy can only emerge from somebody who has really experienced true "Nothingness無". It is also interesting to note that Meister Eckhart (13-14th century philosopher, theologian, and mystic) had already mentioned the same thing 700 years ago in his Christian teachings. Here, please do not run to conclusions and misinterpret the above phrases by simply concluding, "I should not love others" or "I should not love my parents." 1. First of all, teach those who lack love to be more loving. 2. Secondly, be grateful for what others have given you, and express your gratitude by saying “Thank you”. 3. Thirdly, stop all formalities such as expressing gratitude and praying temporarily, and start again from point zero. 4. Fourthly, restart from that point zero, and live a life full of compassion in the true sense, by being in service of others and to grow as a person through such dedicated practice. 5. Finally, your existence itself would be gratitude, prayer, and love itself—you will become "a Being of Compassion". Pascal (French mathematician, physicist, inventor, writer, and Christian philosopher) who tried to disseminate Christianity as a religion of love, prayer, and light, states the following in his work Pensées; “this infinite abyss of void frightens me”. I assume Pascal, while writing about Christianity, reached (or in other words, went beyond to) the state of Absolute Nothingness 絶対無, where there was neither love nor light, and got frightened by the depth of such a state that went beyond his experiences of Christianity. Although this was a profound satori, I feel sorry for him that he did not realize the value of his own satori, as there was nothing similar to that in general Western philosophy at the time. I am sure he suffered a lot, since Christianity filled with light that he had dedicated himself entirely to had vanished, and all that was left spreading before him was infinite nothingness (just a spiritual universe). However, it is no doubt he had reached the most profound truth. It took me ten or more years after I encountered this phrase by Pascal, to fully understand the true meaning of it. After that, I had the opportunity to invite Master Raja Rao, a direct student of Gandhi and an honorary professor at Texas University whom I met at the Japan-France Tsukuba International Symposium to my house. We talked about this phrase by Pascal, and we were both delighted to find out that our understanding of the phrase was exactly the same. Since ancient times, the great life force of the universe, which is the fundamental truth of this grand universe, has been referred to in various ways such as Brahman, Sophia (The Logos of life that spreads in heaven— the spirit of words), Pneuma hagion (the breath of God’s life— the Spirit), Fairies, Absolute Emptiness太虚, Absolute Nothingness 絶対無, Great Life Force, Ku空 (Void), Nonbeing無, Do道, Dharma, and Danma, including the term we use—Tenshin天真 (Heavenly Truth or Cosmic Reality). Regardless of differences in their names, they all refer to the same thing. In the same way this universal truth is called Do道, the “learning system” that uses the body as a medium is also called Do道, such as Judo 柔道 (lit. "gentle way"), Kendo剣道 (way of the sword), Kyudo 弓道 (archery), Sado 茶道 (tea ceremony), and Kado 華道(flower arrangement). Hence, such broad use of the term Do道has created much confusion. In Kenbu Tenshin Ryu, our intention is to practice this great spiritual-universal philosophy through our bodies. In this respect, we should all become "Brahman-ists", "Absolute Emptiness-ists", "Absolute Nothingness-ists", and "Tenshin-ists". If you think, "Oh yes, you’re right. That kind of makes sense", then you are already a well-established "Independent Universe and Body Religion practitioner". We are like modern monks studying in schools, where our workplace is the site of training. We overcome hardships in different social circumstances like fakirs, seek ways to get along well with people who have different values like a knight-errant, and handle daily routines (an important part of a Zen monk’s training) for years. There is no difference in the quality and depth of practice between us living in this modern time, and great monks, priests, and masters of Do道 that had lived in ancient times. As a matter of fact, Shodo書道 and Kenbu Tenshin Ryu practitioners that seek for the truth and walk the Do道through engaging in some kind of body practice, are exactly the same as esoteric and Shugendo practitioners. Some Tenshinkai members actually do Takigyo (waterfall training) in intense waterfalls deep in the mountains (such as in Shintaki and Asama Otaki), even in the middle of winter. This is why Tenshinkai members could easily understand generally hard-to-grasp truths of Do道 that had traditionally been hard for ancient people or even ascetic monks and priests to grasp. We grow trough overcoming hardships at work, receiving criticism, receiving harassments, facing obstructions, being accused, being betrayed, and dealing with gossips…These are the qualities that train us to be strong and help us flower. In this respect, it is necessary for us to put ourselves in challenging situations like Zen monks, both mentally and spiritually from a young age, so that we could be prepared to counter-act difficult situations flexibly and freely whenever necessary. Tenshin Philosophy is a hymn for attaining self-freedom and leading a life filled with freedom. It is also a very friendly and accessible philosophy that encourages us to purify our minds and hearts, elevate our spirits, and to deepen our spiritual qualities. All practices offered by Tenshinkai (as of 2013) including Kenbu Tenshin Ryu, Tenshin Shoho Juku (Tenshin Calligraphy School), Meiso College (Meditation College), and Body Work Aoki Method (based in Shintaido), are all kinds of practices where we learn the Tenshin Philosophy through our bodies. And here, I would like all of you to reconfirm this philosophy I have written above—each and every one of you, in your own hearts—and I strongly affirm that this is something you should keep developing for the rest of your life. Not only is it important to keep walking your Do道wholeheartedly and seriously, but it is also equally important that you “continue”. Always do not forget to have a sense of humor, be jolly, and live joyfully. Additionally, I also want you to remember the importance of forgiving each other. Expressing gratitude, greeting people, and using language properly, are all important qualities that make people feel good and develop a congenial relationship. Bringing mindfulness to these daily attitudes and practices would assist your spiritual growth in pursuing your Do道. Japanese people tend to be strict to themselves as well as others, since the majority of people are expected to be serious and sincere all the time. However, always do not forget the use of humor and laughter in your daily life, as it would serve as a lubricant to enhance your communication, change your mindset, broaden your perspective, and make your life brighter. I really encourage you to cherish this wonderful quality. Let’s move forward with all our heart and spirit, and joyfully step in to a fresh new journey on the last day of this life! The above is based on the introduction I wrote for my book, titled simply Shintaido, published by Shunjusha in Japan in 1997. I encourge you to also read Shintaido, as it explains about the concept of Do道as a goal, as well as Do道 as a learning system in greater detail.